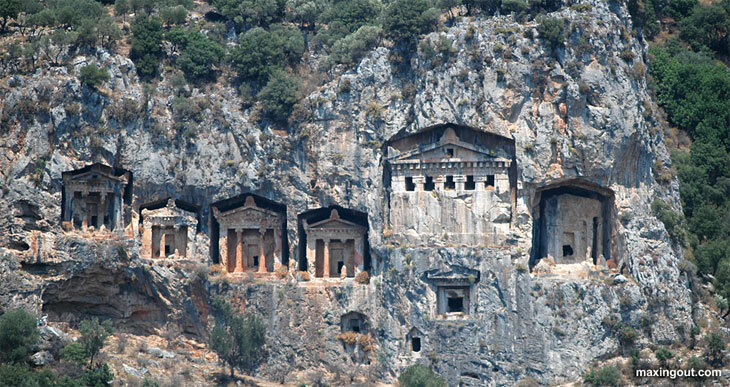 Check out these Lycean Tombs on the Dalcyon River in Turkey. Lycean tombs rock; they come in all sizes and shapes and are found in all stages of completion. Some are ready for occupancy while others never get finished. The largest one in this picture isn't even half done. I suppose the owner died before they could finish with the construction. Man has always had a fixation on the afterlife, and I can understand why. Life is all too short, and death is all too long. People want to have another go at life and earnestly hope the next one will be better than the last. In a way, that's a strange hope. If you couldn't get your act together in this life, why do you think it would be any different in the next? Wouldn't you be the same person over on the other side? In the same way, people want to live forever. That also seems a bit strange when you consider how people spend their time in this life. The average person watches television five hours each day. Many people complain that their life is boring with each new day a carbon copy of the rest. If you are bored now, imagine living in eternity where your boredom will continue forever. If I was in charge of things, I'll tell you how I'd run the show. The rules would be simple. You wouldn't get to go on to the next life until you had done something worthwhile with this one, and you wouldn't be handed eternity on a silver platter unless you had used your time sensibly in this one.. I'm not advocating a performance oriented spirituality where you earn your way to heaven. I'm simply saying, if you don't know how to use your time well in this life, it would be hell for your to enter the next and have eternity on your hands. What are you going to do on the other side - watch television for forty million years and play celestial packman for a thousand years more? I don't know what's going to happen on the other side, and I'm not particularly worried about it either. I'm more concerned about what I'm doing on this side. If I live well on this side, the other side will take care of itself, and I won't be bored. Although Lycean tombs rock, you'll not find me pulling out my hammer and chisel to build one for myself. I'm spending whatever time remains sailing on the ocean of my dreams. Life may be short, but it is good.